Hormonal Balance is an important factor when it comes to healthy fertility and getting pregnant. Throughout the menstrual cycle various hormones are working together in a complex symphony to trigger the components of ovulation and menstruation. Progesterone is one of these key hormones. 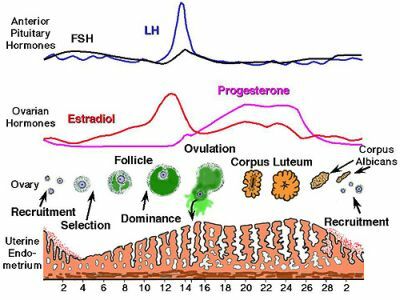 After ovulation progesterone production is triggered by Luteinizing Hormone (LH) which stimulates the corpus luteum (the remnant egg sac) in the ovary to produce progesterone. One of the main actions of progesterone with fertility is to help support a developing embryo. If pregnancy occurs, the production of progesterone from the corpus luteum continues for about 7 weeks (it is then produced by the placenta for the duration of the pregnancy). If pregnancy did not occur, the period begins approximately 14 days after ovulation. When fertilization does not occur the corpus luteum disintegrates, which causes the level of progesterone to fall and the endometrial tissue starts to break-down and shed as menstruation. Are You Progesterone Deficient or Estrogen Dominate? Commercially raised meats and dairy contain large amounts of estrogens, and consuming them can cause hormonal imbalance. PCOS and endometriosis can produce excess estrogen. Hormone testing can be performed by a medical doctor, naturopathic doctor or by an at-home testing service. Testing options range from charting your menstrual cycle to determine the length of your luteal phase, to basal body temperature tracking during your luteal (consistently low BBT may indicate low progesterone production), to taking saliva or blood tests to find out your progesterone levels. The questionnaire above helps to point out signs of progesterone deficiency while these tests help to confirm it. Basil Body Temperature charting can help to determine the availability of progesterone in the luteal phase. There will be a slight, steady rise in temperature after ovulation has occurred and progesterone has increased. An irregular or consistently low BBT may indicate low progesterone and luteal phase defect. If the date of ovulation is fewer than 11 days before your period, this could suggest luteal phase defects. You can detect ovulation using BBT charting or by using ovulation detector strip tests. Dr. John Lee was very adamant that testing for hormones and progesterone should be done through saliva testing, not blood testing (almost all doctors will test the blood). You can order an “at home” saliva test that you will take at certain times during your cycle and then send away to a lab for analysis. They will then mail back the results so you can find out if you have any hormonal imbalances. While Dr. Lee was adamant about getting progesterone testing through saliva, it may be more helpful to work with your doctor to get your progesterone tested so they can explain the test results to you, even if it is a blood test. You most likely will also have other hormones tested at the same time which can give you insights to your entire hormonal profile. The most appropriate time to measure serum progesterone is mid luteal phase (either 7 days after ovulation, or 7 days prior to expected menses). This is when you’re most likely to catch the peak progesterone level. This day will vary according to a woman’s cycle length (for example, for a 28 day cycle, day 21 progesterone testing is appropriate; but for a 35 day cycle, progesterone would ideally be measured around day 28). We have become an estrogen dominate society from all of the excess estrogen in our foods and environment. Vitex angus castus. Photo by Sten Porse. Vitex (Chaste Tree Berry) is one of the most powerful herbs for women’s fertility and menstrual health. There are numerous studies and testimonials of Vitex and its effects on the body. One of the reasons Vitex is so effective and popular is because of its ability to balance hormones while not containing hormones itself. Vitex supports hormonal balance in the body by having an effect on the hypothalamic-pituitary-ovarian axis (hormonal feedback loop), correcting the problem at the source. Capsules: 1,000mg a day is the suggested amount to use. Take vitex all month long. Tincture: 90 drops in water or juice, first thing in the morning. All month long. Unlike powerful hormone drugs, vitex works slowly to normalize the body. Maximum benefits are often achieved after 6-12 cycles with vitex. Natural progesterone cream comes from plant fats and oils called diosgenin which is extracted either from Mexican Wild Yams or soybeans. In the laboratory diosgenin is chemically synthesized into a molecular structure that is identical to real human progesterone. The United States Pharmacopoeia (USP) denotes a recognized standard of purity and strength. It is sometimes referred to as “human-identical” or “bio-identical” progesterone, which differentiates it from synthetic progestins or progestogens. Transdermal application (through the skin) has been found to be one of the most effective ways to use natural progesterone. It is absorbed through the skin into the underlying fat which helps to allow progesterone dissolve slowly into the blood. This way of application helps the progesterone to be “time released” into the blood stream. To closely mimic the body’s progesterone cycle, it is best to use progesterone cream twice a day. Natural progesterone cream is easily and quickly absorbed into the body through the skin within seconds. So you can apply it essentially anywhere as long as you rotate locations of application. When it comes to dosage, more is not better. Too much progesterone may cause hormonal imbalances, just like too little progesterone can. General suggested dosage is 40mg daily, divided into one 20mg application in the am and one 20mg application in the pm, during the two weeks before your period. Progesterone use should begin directly after ovulation, which is usually day 14 in the cycle (day 1 is the start of your period), and end usage once menstruation begins. The best way to know exactly when to begin progesterone cream is to track ovulation with fertility charting. There are several ways to detect ovulation, such as OPK test strips, Ovulation Microscope and Basal Body Temperature (BBT) charting. Once ovulation is detected, progesterone cream would be started the following day. Once you become pregnant, stay on the progesterone and contact your healthcare provider. Read below for pregnancy instructions. A loading does is useful for women who have had many months or years of anovulatory (no ovulation) cycles, which can create extreme progesterone deficiency. Each cycle that passes without ovulation can increase estrogen dominance as progesterone stores are depleted. Very thin women who have little body fat can become estrogen dominant very easily as there is no fat to store extra progesterone. Excessively thin women lack both estrogen and progesterone. In either of these situations Dr. John Lee recommends a higher dose of progesterone the first one to two months of progesterone cream use. This helps to replenish the progesterone stored in the fat of the body. After 2-3 months the dose can be lowered to the usual ‘regular’ dosage. Note: Some progesterone creams come in a squeeze tube, like Emerita Pro-Gest, which uses teaspoons as a measurement for dose. 1/4 teaspoon of Emerita Pro-Gest equals 20mg of progesterone cream. Others, like our Fertilica Natural Progesterone, come with a pump. Each pump measures out exactly 20mg of progesterone cream. Loading dose: 40mg twice a day, one 40mg application in the morning and one 40mg application at night, for a total of 80mg of natural progesterone a day. Apply for two weeks before your period (about day 14 in the cycle), up until menstruation begins. Regular dose: 20mg twice a day, one 20mg application in the morning and one 20mg application at night, for a total of 40mg of natural progesterone a day. Apply for two weeks before your period (about day 14 in the cycle), up until menstruation begins. Dr. Lee had a number of patients in his practice that had been unable to conceive because they were not ovulating. For two to four months he had them use natural progesterone from days 5 to 26 in the cycle (stopping on day 26 to bring on menstruation). Using the progesterone prior to ovulation effectively suppressed ovulation. After a few months of this, he had them stop progesterone use. If you still have follicles left, they seem to respond to a few months of suppression with enthusiasm — the successful maturation and release of an egg. His patients, some of whom had been trying to conceive for years, had very good results conceiving with this method. To learn more about this type of application, please read Dr. Lee’s book What Your Doctor May Not Tell You About Premenopause. Low progesterone during pregnancy can be one cause of recurrent miscarriages. Progesterone is responsible for creating a healthy environment in the womb by maintaining the uterine lining. It also reduces the chances of blood clots and the immune system responding to the fetus as if it was a foreign substance. Progesterone is one of the main pregnancy hormones. If you feel this might be your situation, talk with your doctor or healthcare practitioner and get your hormone levels tested before using progesterone, as well as intermittently through early pregnancy to make sure your levels are high enough. A 2017 study published in the journal Fertility and Sterility found that for 59 women who’d experienced recurrent pregnancy loss (at least 2 previous losses), using vaginal micronized progesterone in their luteal phases prior to pregnancy carried healthy pregnancies. Working with a healthcare practitioner is helpful as they can help to monitor your hormonal levels and determine the best dose of the form of progesterone you wish to use. Make sure to have at least two bottles of natural progesterone cream on hand if this is your preferred form, because running out could cause a big drop in progesterone which may cause the menstrual cycle to begin. Contact your doctor or midwife once you become pregnant so they can monitor your progesterone levels during pregnancy. Progesterone cream can help to oppose the estrogen dominance that occurs with PCOS. By using progesterone cream you are able to mimic a natural cycle and help the body to establish its own cycle, including ovulating, again. Dr. John Lee believed that with progesterone cream and changes to the PCOS specific diet and exercise, PCOS could become obsolete. There are two ways to use progesterone cream for PCOS. The first is the Suppression Cycle. To suppress the cycle one would use progesterone cream on cycle days 7-26. If you do not have a menstrual cycle you would choose a date on your calendar and mark it as day 7. Suppressing the cycle allows the body to rest by stopping the cycle of eggs not being released and estrogen/androgen dominance. Dr. John Lee suggests using 60-100mg of progesterone cream a day during the suppression cycle and to repeat this for 3-4 months for best results. To help your body create a cycle including menstruation and ovulation, use progesterone cream on day 14 of your cycle and continue until day 26. By stopping on day 26 your progesterone levels will drop, helping to start your menstrual cycle. If your cycle does not start, just treat your cycle like you are having one and start again on day 14. It is best to use a calendar so you can keep track of everything. After 3 or so months it is suggested to take a break for 1 month so you can see if your cycle has jump started itself. If you have endometriosis, Dr. John Lee recommends using progesterone from days 8 to 26 of your cycle, to reduce the effects of estrogen on the body (estrogen stimulates endometrial growth). Take a short week off to refresh your receptor sites. He has had success with controlling symptoms within six months. Once the outbreaks of endometriosis are tolerable reduce the usage to day 14 until your menstrual cycle begins. Natural progesterone is safe to use during pregnancy with the consent of your doctor or midwife and may likely prevent many first trimester miscarriages that are due to low progesterone, but should be used with caution when nursing as it may stop lactation. In the first trimester of pregnancy progesterone production is the sole responsibility of the ovaries, but they often fail to produce sufficient levels to maintain the pregnancy. By the second trimester, the placenta itself is responsible for producing progesterone, and it hikes the level of this hormone to 486% higher than the non-pregnant norm. If you are taking progesterone and get pregnant, you must continue taking progesterone until at least the 16th week. I personally would not stop if I had seriously low levels to begin with, but it is best to work with your health care practitioner if this is the case. They will continuously monitor your levels to make sure they are healthy for pregnancy. Lee, John, M.D. (2006) Hormone Balance Made Simple. Werner Books: New York, New York. Lee, John, M.D. (1999). What Your Doctor May Not Tell You About Premenopause. Grand Central Life & Style – Hachette Book Group: New York, New York. Hobbs, Christopher, L.Ac. (2003). Vitex The Women’s Herb. Healthy Living Publications: Summertown, Tennessee. Trickey, Ruth. (2003). Women, Hormones, and the Menstrual Cycle. Giffen Press: South Australia. Weed, Susun. (1986). Wise Woman Herbal for the Childbearing Year. Ash Tree Publishing: Woodstock, New York. I have never used progesterone cream.Lately,I had a failed IVF/doctors were using progesterone injections as part of IVF Regimen.I am planning to undergo another IVF in next few months&trying all the possible things to prepare my body.Wanted to know-would u recommend to use this product ONLY if I find that my progesterone levels are low after a hormone testing.Or would u recommend me to take this as a part of preparation of IVF(without going for hormone-progesterone level testing).Cant I use this without having my levels checked.I want to try this as read about good/positive reviews from your clients.I hope it wont do bad if I try this in preparation for my next IVF. It is best to know your progesterone levels are low prior to using natural progesterone cream in preparation for IVF. Might I suggest learning of the tips in our guide How to Increase Your IVF Success Rate Naturally? I just started using progesterone cream on days 14 to 26 to regulate my cycle. Will I still be able to get pregnant while taking progesterone? Or is it only when I stop taking progesterone? Pregnancy can still happen when using progesterone cream during the luteal phase of the menstrual cycle. If you actively try to conceive during a cycle you are using natural progesterone cream, it is important to test for pregnancy before stopping the cream. If pregnancy is confirmed, consult your doctor or midwife for support in weaning off of the cream or continuing it in early pregnancy. Hello, I have been using Dr. John Lee’s progesterone cream twice daily, however, my acupuncturist has told me to use it every day, from day 1 to the next day 1 of my cycle. My progesterone is on the lower end of the normal range at 82 with the range on my saliva test being from 75-270 pg/mL. I have always had a luteal phase that is about 11 days, so again, just shy of being classified as a luteal phase defect. History of 1 miscarriage. Any thoughts on using progesterone cream daily instead of only during luteal phase would be much appreciated. Thank you! It would be wise to ask your acupuncturist why he/she has suggested this use. Using progesterone cream from day 1 to day 1, all cycle long will stop ovulation in the cycles you do that. It is not suggested this way by Dr. Lee or us. What a journey and how exciting for you! It is going to be best to both have help from your doctor in determining the best dose of cream for your needs and until them finding a 1/2 tsp. measuring spoon as you would use when baking/cooking and measure the dose for each application. It’s best not to guess or “eyeball” it. Did you start the cream again? Have you confirmed pregnancy or not? Is it ok to start progesterone cream 5 days after ovulation? It is my understanding that it is fine to start progesterone cream just after ovulation, 5 days after is fine given what I know. I am 33 and have had one succesful pregnancy 8 years ago. My first pregnancy ended in miscariage. I was fine up until about 2 years ago, I took a progestin only pill for a short 4 months. I started loosing hair and my mood was all over the place. I stopped taking the pill and all of a sudden I ended up with melasma, moods still all over the place, tired all the time, cry at anything. I literally have 1 good week a month. I knew something was off when I developed melasma and I never had that with my 2 pregnancies! I want to try to balance my hormones but wondering if anything natural will make my melasma worse?! my saliva test showed really low progesterone, that of a 90 yr old woman…….not sure how I still cycle? Anyone have any ideas if herbal therapy would help my situaton? I’m sorry for all you’ve been through! When during your cycle was progesterone measured? It is my understanding that melasma is triggered for some in pregnancy, others due to birth control use, and can also be caused by adrenal fatigue. So, it is important to both work to support hormonal balance and reduce stress. We can not know if anything natural will make the melasma worse. There aren’t direct links that I have ever seen. That said, there is such a thing as what is called a “healing crisis” where for some symptoms seemingly get worse before they get better. This is rare, but can happen with natural progesterone cream. I have worked with only one client in my time here thus far who has experienced darker skin spots after application of a progesterone cream (it was not Fertilica Natural Progesterone Cream). Using natural progesterone cream is helping re-establish hormone balance. Most notice that the discoloration ends once hormone levels stabilize. Beyond that, there are many herbs to support hormonal balance. Vitex and Maca are most well known. Royal Jelly is amazing, I feel. So, learn about those. But first a healthy foundation for fertility must be set. If it might be most helpful to have help in setting the foundation and learning the best natural therapies for, we offer the opportunity to work one on one with a fertility herbalist through our Fertility Consultations Program. Any insight into dealing with progesterone for pregnancy at advanced maternal age. I am 48 and still have very regular periods. I am on oral progesterone and have been for about 9 months. Does this mean I have likely been suppressing ovulation? I feel like I have been ovulating. I have grown children and I know my chances are very low at this point but my fiancé’ and I want to see if it is possible. Thoughts? Progesterone (oral or transdermal) is only known to suppress ovulation if used prior to ovulation. It will not suppress it if used the two weeks prior to the start of menstruation. It is in menopause and after that progesterone cream usage guidelines may shift some, but until then the suggestions we share in this guide are known to be universal. I have had three miscarriages and have experienced infertility for the past 18 months. Based on extensive hormonal testing done by my doctor it has been found that I have low progesterone. I’ve been on progesterone suppositories equalling up to 400mg a day for about 6 months with no result as of yet. Thinking of trying the route of natural progesterone cream, vitex, and maca…In your opinion would the natural progesterone cream be enough of a supplement? I see that it is 20mg? Wondering if it works in a different way though, and if the combination of the three items will actually help my body to make its own progesterone for the long haul? Can please have “no result as of yet” clarified? Do you mean progesterone levels have not increased, or that you haven’t yet conceived? Do you know your estradiol and progesterone levels as well. Can you share what in more detail what your experience of “infertility” is like (what are your cycles like, do you ovulate, do you have a 12 day luteal phase, etc.? I look forward to offering continued support. This is so informative! I had a MC May 2018, and it has taken a while for my cycles to return to my normal. I generally ovulate CD23-25, and have 35-39 day cycles, but they are regular. Since the MC, it took a while to come back down to my usual length, but I noticed my CM wasn’t drying up post O, and I chart everything, as I have for over a year. So, I am going through the checklist, and realize that I have more symptoms of high estrogen. my luteal phase is usually 12-13 days. I had my progesterone tested (obgyn sid 7-10 days post ovulate), I tested 3ng at 9 days post ovulation. How do you determine which you have, low prog or high estrogen? Thank you! Often having high estrogen means progesterone will be low, but testing and having your doctor interpret test results will help you know for sure. Yes, progesterone cream may need to be stopped for menstruation to start. Yes, if you actively tried to conceive, it is important to test for pregnancy before stopping progesterone cream. I’ve been trying to conceive for 5 years, with no luck. 6 IVF +1 frozen cycle. After the last treatment I haven’t got my period back. It’s been 2 months now… Should I start progesteron cream? If yes, does it matter when? I am so sorry to her of what you’ve been through! We only suggest progesterone cream if progesterone levels have been found to be low. Has your doctor been able to tell you why he/she thinks IVF has yet to be a success? Will using progesterone cream to help with endometriosis cause my body to stop making it’s own progesterone? Also, if I were to become pregnant while using the cream and continued using it as outlined in the article and video above, how would a doctor know based on test results of my progesterone levels at 20 weeks, if it is safe to take me off of the cream? Is there a way to know that the placenta is truly taking over and producing progesterone? My concern over guessing at this would be a miscarriage at such a late stage in a pregnancy. Thank you for this great source of information. Any feedback would be really appreciated. Using natural progesterone cream will not stop the body from making it’s own. But it’s use is to supplement and body that can’t make it’s own well enough for whatever reason. By using progesterone cream, one is directly offering the body progesterone is recognizes as its own. Do talk to your doctor about how he/she would know that progesterone can be weaned off of at the suggested time in your pregnancy. There are likely tests or markers he or she will use to determine this. It is around the 14th week of gestation that progesterone production will happen solely by the placenta, rather than the ovaries. When this happens, progesterone production naturally slows down. Progesterone cream use is proven effective in pregnancy under the care of a professional who will guide and monitory you, and ease any concerns. Should progesterone cream be used in the same way for menopausal women. Our site focuses on guiding women who have not yet begun menopause. It would be best to find a resource for guidance that focuses on women in menopause. Dr. John Lee or Dr. Christianne Northrup may be two to look into. Based on our research and one-on-one work with clients, we have found those who take Vitex consistently for a minimum of three months, often longer, without taking a break experience the most positive results. Is it possible to get hormone imbalances when you use it for a longer period at a time? I was pointed out by someone that it might be harmful in different ways and can cause illness or negative side effects. So now I am worrying a bit about that. I thought that maybe it might be wise then to take a pause every couple of months when pregnancy does not occur. (I have progesterone deficiency) Thank you so much for answering my question. What we know is that it can take anywhere from 4-12 months to bring progesterone levels back up in women with very low progesterone levels. In general we suggest its use, while following a holistic natural fertility program, for a minimum of three months, up to 6 months while paying attention to how the body is responding/shifting before making a change to said program. It would also be a good idea to have progesterone levels monitored during this time to know how levels are shifting and if you might need to adjust the dose, or if you can wean off of progesterone cream. Each woman will be different, so the length of safe use for you will likely be different from the length of safe use for me or another. Hi! Thanks for the great article! I’m just about to embark on my next Embryo Transfer. I haven’t ovulated yet but am thinking of taking the cream after ovulation. Although, I did progesterone testing on my last two cycles, the first with a level of 16ml and last month at 17ml. Is my body already producing enough to sustain a health pregnancy without the cream? Or will taking a little bit “extra” be beneficial in some way? Side note: I do have PCOS with long cycles. However, when I ovulate, my progesterone blood levels are in the normal range. I can’t support using progesterone cream with normal progesterone levels or during this time without your doctor knowing and guiding you. Please talk to your doctor or at least his nurse before starting progesterone cream during this time. We share other ways to prepare for embryo transfer in our guide 5 Steps to Preparing for a Frozen Embryo Transfer should that be helpful! Vitex is known to help the body increase LH production and stimulate the formation of the corpus luteum. The corpus luteum is responsible for the secretion of progesterone. We know it to be best taken consistently for 6-12 months for optimal effect. That said, there may be more to consider, such as progesterone cream, dietary and lifestyle changes, a whole food multivitamin, omega-3s and B vitamins (a B complex maybe). Maybe our guide Mid-Cycle Spotting – Should You Be Concerned? will share some helpful tips/info as well. I do hope so! Hello, I have PCOS and started to take progesterone cream on day 12 of my cycle. Today is day 21 and I started bleeding and cramping a little. I’m not sure if it is a period or just spotting, but should I continue taking the progesterone cream until day 26 ? Can you tell me what should I do if it is just spotting, and what should I do if it is a period ? Thanks a lot. If this is just spotting, progesterone cream can be continued as instructed. If menstruation starts, progesterone cream is best stopped and started again as instructed. It is okay that the start date of the cream shifts should this be menstruation. It may until the body shows regularity and balance again. It’s great that you’ve seem some shifting already! I have stage 4 endometriosis diagnosed via laparoscopy.We have been ttc for 17 months and then took a break as my docter have put me on Visanne(dienogest).I started bleeding on 20 march and got a positive HCG test on 1 April and the next three days negative HCG test? My docter says the bleeding is from my body that is still “settling” from the Visanne. We have tried Vitex, OPK, BBT, Charting and everything to conceive with no luck.I have endometriosis on my ovary and pelvic wall lines.I don’t know if I ovulate.My doctor said my tubes are fine after my lap but never tested if they are blocked or not. 6 months after excision surgery i had an endometrioma back again.Any ideas on to conceiving? I am sorry for all you’ve got to deal with. That may be possible yes. I have spotting for 3-5 days prior to day 1 of my cycle. I have been told by my RE that I have low progesterone, though I still don’t know why, and have been struggling with infertility for almost 3 years. As we gear up for our 3rd round of IVF, we’ve been ttc naturally. I had left over Crinone progesterone suppositories that I began 3 days after ovulation twice a day (last cycle). Unfortunately, I ran out after 4 days and thought I had more but didn’t. My menses started soon after I stopped and was about 3 days early. I’m trying to find a progesterone cream that could help me conceive. I’m confused though by the cream containing soy. I thought I’m suposed to avoid soy? Processes, GMO soy (not so much fermented soy or non-GMO whole edamame sparingly) is best avoided when battling infertility. Regarding bio-idential progesterone creams however, there is a substance called diosgenin in soybeans and wild yams that is extracted and then modified in a the laboratory to create the progesterone found in progesterone creams. It is no longer the soybean or mexican wild yam, as a whole plant, but rather just one chemical part of the plant. Only the diosgenin from the soy would be converted to bio-identical progesterone and there would be no trace of it’s other chemical make-up such as the phytoestrogen content or isoflavones that you will most often read about related to female fertility. Thank you so much for your wonderfull work. What can you advice when you have Endometriosis and PCOS and want to get pregnant? Hormone balance support is indeed indicated! Much of what can be done to support a return to balance can be helpful for both issues. I would definitely suggest learning more about the Fertility Diet and choosing low-GI foods if insulin balance issues accompany your PCOS. I would then suggest a review of our guide 5 Steps to Reversing Endometriosis Infertility.